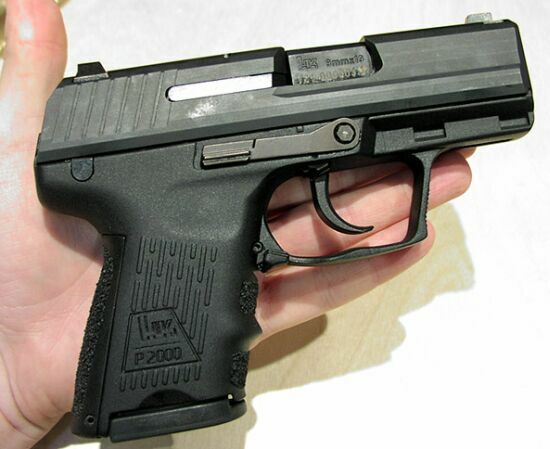 HECKLER&KOCH P2000-K It is no longer a rumor. At long last, visual proof that the P2000 Subcompact is alive and well, albeit in prototype form. These exclusive photos were taken an hungarian gun writer that broken the story on a firearms board on the Net on March 18: he had the foresight to ask HK GmbH at the IWA show in Nuremburg, Germany March 14-17, and was undoubtedly surprised to find out that they happened to have one in the back, and that he was allowed to photograph it. This prototype is serial number 121-000003. The gun retains the features of the full size P2000, including the replaceable backstraps of different sizes as well as the ambidextrous slide release, and a barrel length of about three inches. Perhaps the best news is that the magazines will be interchangeable with the full size P2000, a first for an HK pistol design. This will make little difference other than for handhold for the American shooter, given the restrictions on magazine capacity and the ten round limitation. The flush fit magazine also holds ten rounds. First production delivery is slated for the latter half of 2004, first to European police units, so it may be some time before the gun is available for sale in the United States. 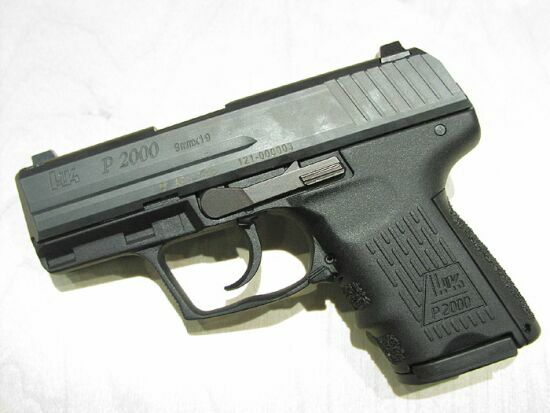 But it is no longer a rumor, you have proof here that the prototype is built, and further design and testing will lead to the newest, as yet unnamed P2000 variant. Will it be called the P2000K? Or will "Subcompact" stick? Many shooters have been calling for a USP/P2000 subcompact for some time now. It is great to see this desire become reality. More information to follow as soon as it becomes available.